If you ask me, Marvel seemed to be going through a bit of a funk recently. Due to its uneven tone, Age of Ultron failed to live up to the months of hype the studio brought it. Ant-Man was solid fun, but anyone hoping for even the tiniest amount of a substantial or innovative plot would have been left woefully unimpressed. Even Deadpool, Marvel's supposed saviour, fell victim to the studio's same shortcomings, and failed to acknowledge its flaws despite its heavily self referential tone. Marvel were seeming content to put out films with top notch premises that had little to nothing going on behind the awe and spectacle. I was prepared for the third Captain America film, Civil War, to follow the exact same path. So what a surprise it is, then, that not only is Civil War Marvel's strongest film to date by a wide margin, but also a powerful, intricate and thoughtful character study unlike anything Marvel have attempted before. After a botched mission, the United Nations propose that the Avengers sign a contract allowing them to be monitored and policed by the government. Naturally, the response is divided: Tony Stark (Robert Downey Jr,) believes it is the right path for them to take, while Steve Rogers (Chris Evans) criticises the contract due to his lack of trust in the government. 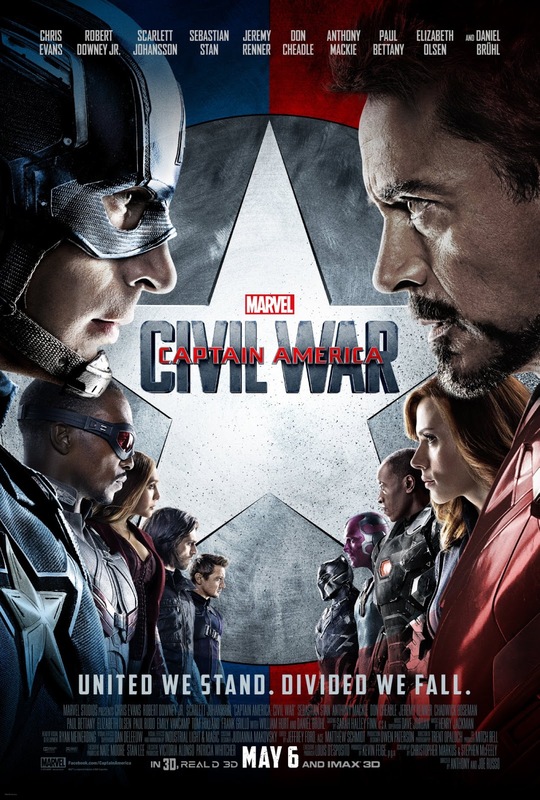 Simultaneously, Helmut Zemo (Daniel Bruhl) attempts to gain the location of various Winter Soldiers, and plans to use Bucky Barnes (Sebastian Stan) to do so. There's a hell of a lot going on in Civil War - probably more than the last five Marvel films combined - but it's testament to writers Christopher Markus and Stephen McFeely that the film retains a perfect grasp on its various threads throughout. The first ninety minutes or so of the film attempt to juggle a wide variety of character arcs and plot threads, and it succeeds in keeping each and every one of them perfectly balanced. We never feel as if the focus is lying on the wrong person at any time, each development and each scene transition feels strategically placed, and it allows the film to pull through what is essentially (and impressively) a rather long stretch of mostly dialogue without ever becoming stale. But where even more credit must go to Markus and McFeely is how personal and intimate Civil War feels. Rather than set up a conflict between the two sides and just let them battle it out, the film deepens its already impressively strong hold on these characters. Black Panther (the film's one and only underdeveloped character) believes that Bucky killed his father, creating a personal rift across the two sides. Iron Man and Captain America both feel betrayed by each other, allowing their leadership to flourish but never losing sight of their humanity. Black Widow and Hawkeye have a strong friendship despite their opposing views on the contract, and the film's script cleverly acknowledges this rather than sacrificing their bond in favour of a cool punch or witty one liner. After the film's masterful first half culminates at an airport, an all out brawl takes places between both returning characters and newcomers (Tom Holland's excellent take on Spider Man is the film's most surprising success), yet the character dynamics are never lost amid the spectacle. The scene is bombastic and loud and fast paced, but also personal, gripping and extremely well mapped out. While watching the film, I had a major issue with the airport scene: it was too funny. After a first half that so efficiently and carefully built up this fragile house of cards, it seemed to all come crashing down in a final showdown that botched seriousness in favour of comedy. In all honesty, I was frustrated watching it. But, once the scene ended, I realised something. The airport scene wasn't the film's final showdown. I put my troubles aside and refocused on the film I was deeply enjoying, and before long that final showdown came, and let me tell you this: you really need that airport scene to be funny. The film's final showdown narrows its focus to three central characters (with another two cleverly placed on the outskirts), and it is by far the most emotionally invested, heart-poundingly intense sequence Marvel have ever pieced together. This is where the film's slower first half truly pays off. After a narrative twist that feels both heavily foreshadowed and entirely out of the blue, the film shows its true hand, and it is breathtaking. It puts a certain other recent superhero vs superhero film to shame, and then some. I've spent years wishing Marvel would try something different, praying that eventually they would depart from their formula and tell a different story. Civil War not only does that, but does it in a near-perfect way. The film abandons the typical villain character that most Marvel features are bound by, instead offering more a puppeteer than a straight up "bad guy". The character dynamics are foregrounded over zappy jokes and cool cinematography, and it creates the franchise's richest film to date, both emotionally and thematically. 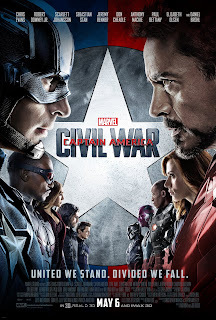 Civil War is everything that big blockbuster entertainment should be: it's enjoyable and wonderfully entertaining, but it also has the courage to go that bit further and tell an impressively layered story with thought-provoking themes and ideas. The film is notably clever in a variety of ways - namely in how it balances a multitude of characters, and how it builds towards a climax it doesn't seem prepared to play out, before pulling the rug out from beneath your feet yet again - but it never feels like it's trying to be more than it should be. Deadpool was marred by its smugness, Ant-Man was let down by its over-reliance on humour, and Age of Ultron was plagued by its uneven tone. Civil War takes on board every misstep that Marvel have undergone, and gives them a sharp course correction. It is simply exhilarating film making, and the kind of "Big Budget Spectacle With Brains" that the film industry so desperately needs more of. Please don't drop the ball again guys, please? Please? To Summarise: Intelligent, sophisticated and refreshingly willing to subvert its own formula, Captain America: Civil War is both Marvel's strongest film to date and a consistently compelling character study in its own right with much more on its mind than eye popping set pieces.